Happy Groundhog Day! I’m sure winter will be over any day now. Right! On Monday and Tuesday we will finish our Bernoulli’s experiment and the final homework from our fluid mechanics unit so that we can take our unit test on Wednesday. Next, things will heat up as we examine thermal physics. On Monday, Tuesday, and into Wednesday we will complete our analysis of the role of kinetic energy in collisions by doing assignment 3 and taking a quiz as announced. Following that, we will look at the impulse-momentum theorem. To prepare for that topic, please take notes on Podcast 10 – Introduction to the Impulse-Momentum Theorem and Podcast 11 – Impulse-Momentum Theorem Sample Problem when announced. Expect a test by the end of next week. Finally, your conservation of momentum lab report is due at the start of class on Thursday with the upload to TurnItIn.com due by 3:00 of that day. We will complete our constellation activity by the end of class on Tuesday, and this will wrap up our star mapping learning objectives. On Wednesday we will take a star mapping quiz in the planetarium. Podcast 1 – Star Mapping will help you study. After that we will start to examine how the sky changes when we travel north-south on the planet. On Monday of this past week, a large asteroid flew fairly close to Earth. It is widely accepted that a huge asteroid impact on Earth led to the extinction of the dinosaurs about sixty-five million years ago, so we have reason to be aware of asteroid behavior. To prepare, NASA’s Near Earth Object Program analyzes the trajectories of asteroids with the intention of finding potential impacts years before they might happen. This will give us time to do something about it. Check out this video to find out more! We’re almost done with JANUARY! Time FLIES when you toss an exam week into a month! We will continue to explore fluid mechanics by completing our debrief of homework 1 on Monday so that you can take a quiz over hydrostatic pressure on Tuesday. Also on Monday we will examine buoyancy so that you can do homework 2 for Wednesday. Our next topic will be fluids in motion as we explore fluid flow continuity and Bernoulli’s equation. Expect a test by the end of next week. On Monday we will complete assignment 2 so that we can take a quiz on Tuesday or Wednesday, as announced. Next we will perform our collisions experiment, which I think is a lot of fun! As announced after the lab, please take notes on Podcast 5 – Elastic Collisions part , Podcast 6 – Elastic Collisions part 2, Podcast 7 – Totally Inelastic Collisions part 1, Podcast 8 – Totally Inelastic Collisions part 2, and Podcast 9 – Inelastic Collisions. Two things happened this week that made me think about climate change. One was the news that 2014 was the warmest year on record for our planet. (Yes, even though it was cold here, the rest of the world more than made up for our polar vortex chilliness.) 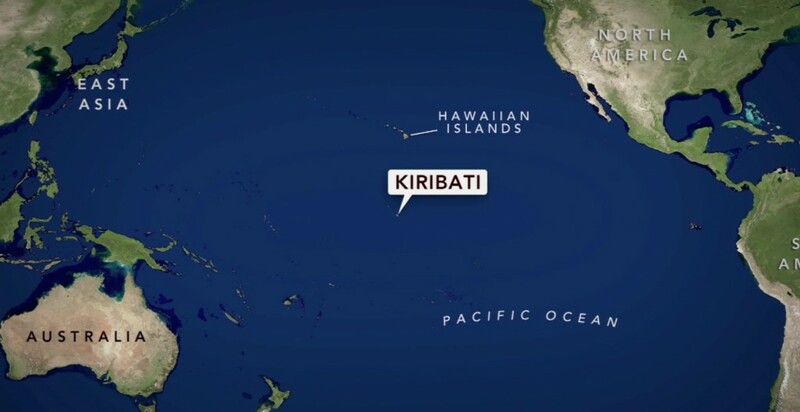 The other thing that happened was I saw an ad by Skype about a Pacific island nation called Kiribati that is literally drowning as sea levels rise. I questioned this…How can a whole island drown? It turns out to be true. The island is only ten feet above sea level, and the oceans are rising at an accelerating rate. Within twenty to thirty years, the ocean waters should be so high that the groundwater (the only source of fresh drinking water on any island) will be contaminated. The government of the island is faced with the enormous challenge of finding a new home for all of their 102,000 people. Emotionally, the country is bracing itself to lose its culture and its community, raising the question, if a nation drowns, is it still a nation? Welcome to a new semester! Congratulations on all you have accomplished. If you were in my first semester astronomy course, please note that you can unsubscribe to this blog by clicking the unsubscribe link at the bottom of this email. It’s momentum time! For Tuesday please take notes on Podcast 1 – Introduction to Momentum. This will prepare us for a very short assignment followed by a quiz, as announced. For Wednesday please take notes on the more complex topic covered in Podcast 2 – Conservation of Momentum part 1, Podcast 3 – Conservation of Momentum part 2, and Podcast 4 – Conservation of Momentum Sample Problem. We will complete an assignment on these in class on Wednesday and Thursday in order to prepare ourselves for our experiment, the Conservation of Momentum Lab. Finally, remember that your energy research paragraph is due to TurnItIn.com on Wednesday. WELCOME TO ASTRONOMY! I’m definitely pumped to work with all of you, and this is a pretty cool course. To get started, please go to our main class webpage and read the course policies and procedures document. Please print and sign only the last page and turn it in by Friday. This week we will take an astronomy readiness assessment. Let me reassure you that this test will not count for a grade. It is merely a skills and prior knowledge assessment. Then we will begin to explore the techniques of sky mapping in order to locate stars and constellations using our Star Map – North and South Declination. This means we will get to spend a significant amount of time in the planetarium! Alright! Our focus is Unit 1: The Celestial Sphere. Celestial Sphere Podcast 1 – Star Mapping and Celestial Sphere Podcast 2 – Celestial Equator and Celestial North Pole. You don’t have to watch these podcasts before class, but they will help you if you are confused, are absent, or wish to review.